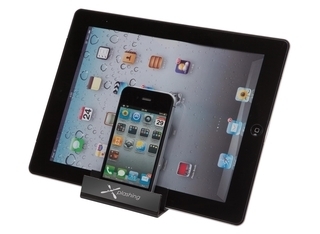 New York Card & Tech Stand is designed to hold business cards, mobile phones and tablets. Made with a tough metal frame, this ingenious stand protects the devices from scratches with its soft-touch velvet lining. A metal accent plate for logo engraving adds that little extra finish. Product size is 8.5cm wide x 6cm high x 8.8cm deep.